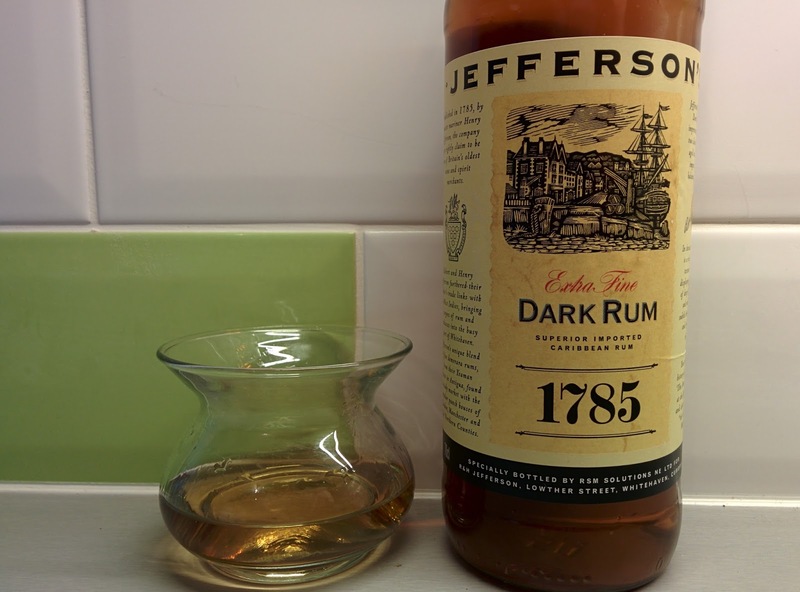 For a drink so intimately associated with the tropical climes of the Caribbean rum has a long history in the UK. From the centuries of tradition behind London's Smith & Cross to the upstart Dark Matter in Banchory the booze reaches across the centuries. Wandering the rum selection at Royal Mile Whiskies I came across this interesting looking bottle, at £27 it didn't really scream "buy me" but one of the staff recommended it so I figured why not? Whitehaven in Cumbria is a historic trading port, merchants imported tobacco from their holdings in Virginia until the American War of Independence saw them pushed out and into the Caribbean where sugar and its byproduct rum started to be traded back to the mother country. The Jefferson's, distantly related to US founding father Thomas Jefferson started shipping rum in 1785 from their Yeaman estate in Antigua, hence the name of this rum. Over the years the Jeffersons expanded their booze empire and were the suppliers of fine wines & spirits to White Star Lines, owners of the ill fated RMS Titanic. "an impressive marriage of two classic rum styles aged in oak casks to impart a complex balance of flavours"
which is nice, but doesn't say what those two styles are or how long it's been aged! From what I can glean the spirit is imported from the Caribbean then blended and aged in a bonded warehouse in Liverpool. Once you pour a glass of this and give it a swirl you see the long, long legs and get a pungent, slightly grassy hit of toffee & nuts. This is clearly heavy on the pot still distillate and has some similarities to Smith & Cross on the nose but is a tamer 40% ABV. A sip gives you an initial light toffee and nutty, banana-y notes follow with dark chocolate and slightly burnt treacle edge to things, the mouthfeel is thick and chewy, you can feel it coating your mouth but then it gets a little thin as you swallow it, likely due to the young age and/or some column still making its way into the blend. Most likely it's a bit of both, column distillate is relatively expensive so a cheaper column distilled rum can help keep costs down while also adding lightness to the rum. It's certainly warm on the way down but stops short of being harsh and there's a lingering after-taste of stewed bananas. It works perfectly pleasantly with coke but trying it in a treacle is really impressive, there's a real depth of flavour that makes for a particularly good cocktail. All in all this is a good buy for the price and something a bit different. Dark Matter Spiced Rum - science for the win! Spiced rum, the creator of myriad student hangovers, a drink that somehow takes the word "spiced" to mean "a ton of synthetic vanilla". With a few, very few, honourable exceptions I'm not a fan of the breed. Into this market, dominated as it is by the nautical themed behemoths that are Captain Morgan's Spiced and Kraken comes Dark Matter. Founded by brothers Jim and John Ewen this new micro-distillery based in Banchory in North-East Scotland is about as far as you can get from the "yo-ho-ho" "but why is the rum gone?" marketing that predominates in the rum world both in approach and geography. Taking a scientific approach to the rum making process the brothers spent two years experimenting with different yeast strains and indeed isolated a local wild strain of yeast in an effort to perfect their product. After changes to the tax laws made micro-distilleries more economically viable they spotted that while new gin distilleries are popping up everywhere there was no-one else distilling their own rum. Working with a custom still that is designed to give lots of lovely copper contact to the liquid the brothers have started their portfolio with this spiced rum at £35 for a 70cl bottle at 40% ABV. Made using the highest purity molasses available in a custom built distillery this is obviously going for a more discerning drinker, the type of consumer that has helped fuel the craft beer and micro-distilling explosion in recent years. "Our curiosity drives us while science inspires us. 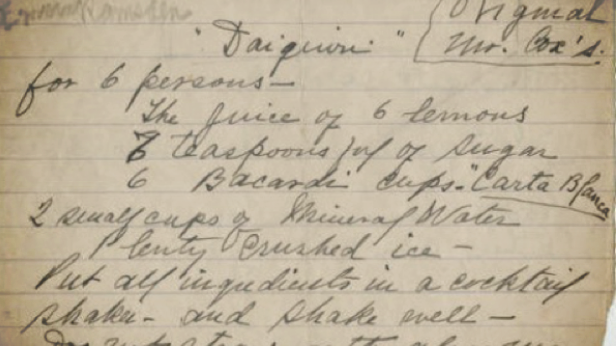 Combining knowledge and imagination we obsessively pursue flavour through systematic study, observation and experiment." 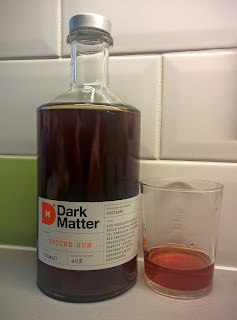 Now many a lovely bottle has been let down by a poor liquid but opening a bottle of Dark Matter you're immediately hit by, well, spice. Ginger and cloves mixed with stewed fruits give an immediate warmth. That ginger comes to the fore on the first sip followed by pepper and a soft chilli and the fruit mellows everything out to create a very well balanced drink. There's a very pleasant lingering aftertaste and this goes down very, very smoothly for a rum that must be very young indeed given their first distillation was only in April. Some of the depth and complexity of flavour comes from borrowing a technique from the bourbon world. As the molasses is fermented some of the liquid that is left in the still after distillation is added back to increase the complexity of flavours produced, bourbon fans will recognise this as "sour mashing". This is a very, very impressive rum indeed, a spiced rum that is truly spicy, that can be sipped easily. Innovation and craft like this should be applauded. What a rum aged in the Aberdeenshire climate will turn out like I'm very keen to find out and also look forward to the white rum that is in the pipeline. This is an excellent purchase that I truly did not expect to enjoy as much as I did.